The inscription listings have been newly updated for all headstones within Section B. This update includes graves which were previously missed when the previous listing was made, and also any inscriptions that have been added to new or existing headstones since then. 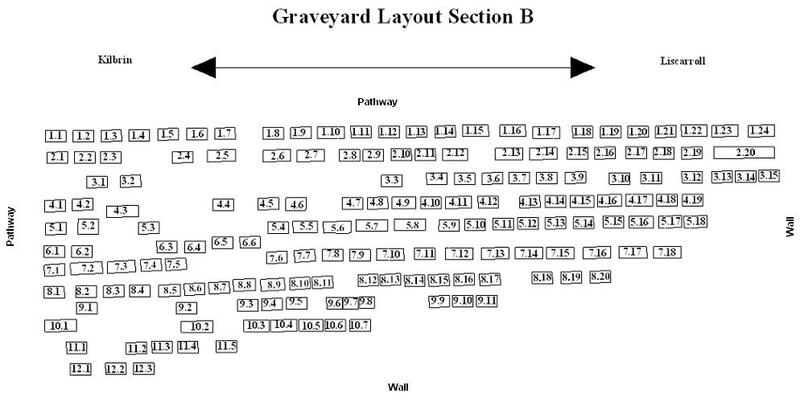 A detailed map of all headstones within section B is provided below to allow visitors to easily locate a grave of interest. Many thanks to Sheila O'Reilly (Garranmacgarrett) for the vast amount of work involved in updating the listings for this section. His Son Edmond O’ Brien Died May 31, 1929. Her husband Patrick (Snr.) Died March 31, 1954. Died June 19, 1976 Interred in U.S.A.
Died Feb. 27, 1980 Aged 92 yrs. Died Feb.24, 1977 Aged 33 yrs. Died Jan. 29, 1995 Aged 84 yrs. 1 West View Pouladuff Road Cork. Who Died Feb. 12, 1986. His sons John & Joseph. Also His son Michael Cronin. Erected by John Horgan Killcaskin. In Loving Memory of his wife Catherine. Died Aug. 9, 1901. Age 82 yrs. Died June 9, 1938 Aged 68 yrs. His mother Bridget Cronin Derryorgan. Died Feb. 16, 1927. Aged 84 yrs. Died Sept.5, 1948. Aged 80 yrs. Died Nov. 24, 1961. Aged 80 yrs. Their son Rev. Fr. Tom Ahern P.P. Died Dec. 1931. Age 36 yrs. Died Jan 20 1951 Aged 67 yrs. Died Feb. 12 1832 Agde 59 yrs. Died April 1916 Aged 72 yrs. Daniel D O’ Mahony Kanturk. Died Jan 27, 1981 Aged 38 yrs. Died May 28, 1999 Aged 43yrs.